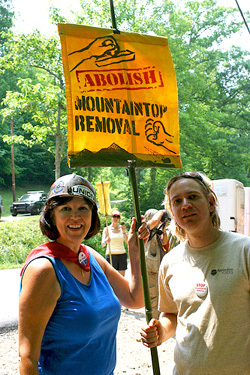 Executive Director Willa Mays with Stefan Jirka from Blue Moon Fund during the Blair Mountain March. They came to Blair Mountain from far and away; from the coalfields, from devastated mountains and from communities across the nation that have never known the paralyzing grip of coal. Last week, the staff of Appalachian Voices joined over one thousand people in the March on Blair Mountain, to speak out for the mountains and the people who call them home. All walks and stages of life marched together in a peaceful display, and I was honored to walk alongside them. The willingness to blow up Blair Mountain, a site of historical significance and perennial natural beauty, shows that truly nothing--except profit -is sacred to the coal industry. We hope that the March on Blair Mountain will serve as a catalyst to end mountaintop removal. Recently, Massey Energy, the largest MTR coal company, was bought out by another corporation, but they cannot hide their track record of environmental devastation and disregard for miner safety behind this new parent company. 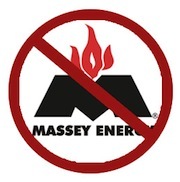 I’d like to ask you to sign the petition to revoke Massey’s charter and call the company what it really is: a corporate criminal. To all those who came out to Blair Mountain, you have my respect, and to those who supported us from afar, my gratitude. Let’s continue on with the spirit of this past week, and send a message to Massey--we the people granted you a charter in the first place, and we the people will take it away. Massey Energy--the main culprit behind mountaintop removal practices--is one of the biggest coal polluters in the world. Their disregard for safety regulations led to the death of 29 miners in last year’s Upper Big Branch disaster. Hellbenders, gyotaku, and watermelon -- Oh my! Invest in a clean energy future! For as little as $10 per month you can help move the Southeast away from coal and make way for clean, renewable alternatives. 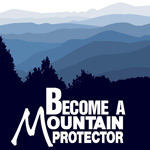 Visit our Membership Page to make a monthly donation and become a Mountain Protector today. state-by-state sampler, a regional waterfall guide and a glimpse into the secret world of Appalachia's wild orchids. The Community Garden Market of Berkeley Springs, W.Va., is a thriving market with a complete selection of natural and organic foods along with remedies, supplements, books, pet food and much more. Visit them online for recipes and information on healthy living. ONGOING: Don't miss your chance to see a showing of this documentary film that examines Coal River Valley's fight to save their community from Big Coal. July 2-3: Featuring local and regional musicians playing bluegrass, gospel, country and old time music. Come out for poetry readings and home-cooked pot-luck meals. Kayford Mountain, W.Va.
Jul 8-9: Come out to the 14th Annual Music Fest N' Sugar Grove with headliners Doc Watson and the Carolina Chocolate Drops. 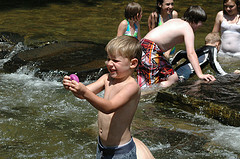 Sugar Grove, N.C.
Jul 14-17: Attend a weekend workshop on self-sufficiency and wilderness skills taught by master teachers in a fun and creative setting. Asheville, N.C.
Jul 28-31: Have fun at one of the biggest music festivals of the summer with headliners Sam Bush Band and the Nocturnals. Floyd, Va.